So, after completing your Zoom! teeth whitening, you’re astounded by how effective it truly was at removing stains. When the dentist said it would reach underneath enamel, he wasn’t joking! While the effects are amazing initially after treatment, it’s important that you know the right steps to keep your smile looking white. Otherwise, you’ll need to come back sooner rather than later to keep your smile as white as possible! After completing Zoom! teeth whitening in Winthrop, practice these four habits. Many patients don’t realize that their teeth will remain porous after they complete whitening treatment. This is due to Zoom! Whitening’s light activating the whitening agents. It’s also caused by the enamel being opened up so the bleach can travel to the dentin, the largest source of intrinsic stains. For the first week after whitening, it’s important that you avoid consuming substances that can easily stain teeth, including coffee, red wine, dark berries and dark colas or teas. You should avoid all tobacco products as they can significantly stain teeth, especially directly after whitening. It’s common for people to feel minor sensitivity after treatment since the pores of tooth enamel are opened up during whitening. Therefore, you’ll likely feel this sensitivity when exposing your teeth to extremely hot or cold temperatures. While this sensation should only last for a few days, you may want to use a toothpaste or mouthwash specifically designed for sensitive teeth. If the sensitivity is particularly bad, you can also benefit from taking over-the-counter medications like ibuprofen. Avoid aspirin as direct contact with it can cause a burning sensation in your teeth. The most important step you can take in retaining your white smile is sticking to a strict oral care regimen. Brushing twice a day with a fluoridated toothpaste is necessary not just to keep plaque at bay, but remove surface stains when they appear. For extra protection, consider purchasing a whitening toothpaste specifically for removing surface stains. These brands usually contain additional bleaching agents and abrasives to aid in keeping your smile white. Furthermore, make sure to floss at least once a day as well. Brushing only removes about 60 percent of plaque on teeth, while flossing works to remove stains from the sides as well. For extra protection, try incorporating a whitening mouth rinse. These are usually given additional fluoride for extra protection. 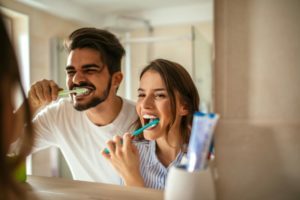 Even with the best at-home habits, you’ll still need to visit a cosmetic dentist in Winthrop to keep your teeth as white as possible. On average, people typically need to visit every four to six months for touch-ups. Taking care of your investment is easy when you know the right steps. Schedule an appointment today to get your touch-up appointment done! Dr. Howard M. Brooks is a member of the American Academy of Cosmetic Dentistry. To take advantage of his current specials on Zoom! Whitening as well as learn more about his numerous cosmetic treatments, you can contact him through his website.